Get those cards out there! As I have said before, a chain is only as strong as its weakest link, and I write my first post of the New Year only to make our collective efforts better – by discouraging complacency, improving the flow of information, and flagging up continuing areas of weakness. Being a critic of the Church of England’s approach to Safeguarding and victim care is not a lot of fun. One truly wishes to be positive and affirming of effort honestly expended and earnestly advanced, but so often one sees ‘solutions’ inadequately thought through and/or opportunities missed to rebuild bridges with those we have estranged. Last year had more than its fair share of discomfort for Anglicans of the Mother Church as it struggled to convince victims, public, press, IICSA and a host of critics from various quarters that a toxic and complacent past was being fully and urgently addressed. Early in this coming year, yet another round of IICSA will bring further revelations and challenges. When Bishop Peter Hancock warned General Synod last February to expect two years of bad news, he was being characteristically honest and realistic, but the church at various levels has not been inactive. The little card prompting good responses to disclosure is deceptively simple. Distilling the essence of experience into such an initiative takes skill and leadership, and things are happening on a range of other issues, too. The House of Bishops announced further Safeguarding guidelines designed to improve the flow of data about the extent of identified safeguarding issues within the church. The information will be lodged with the Charity Commission and, as such, is a step towards the collation of better statistics and outside involvement. We have also seen the appointment of former MP Meg Munn as the independent Chair for the Safeguarding Steering Group; and the temporary appointment of Sir Roger Singleton as National Director of Safeguarding pending a more stringent search for a permanent candidate. All these steps will hopefully prove beneficial in the long-term, but they have unfortunately pressed a bruise with the victim community for one simple reason: all are ‘top down’ initiatives created without discussion with those who have experience of being victims of the Church. One amusingly pointed out that among new purchases at Church House there must surely be a curtain ruler to measure the yardage of paper behind all these initiatives. There is nothing wrong in principle with any of these developments, but, as the song goes, ‘It ain’t what you do, it’s the way that you do it’. Talking to members of the victim community, they tell me that what has been missing from these initiatives is engagement with that important sector. “Nothing about us without us” is the apposite slogan of the Disabled lobby, and this surely applies to various others, not least to our historic abuse victims. Initially the response to these initiatives was encouraging. Meg Munn was seen as a fresh external eye whose presence would improve the focus of our safeguarding deliberations, but then folk began to ask which of them she had yet engaged with, and the answer was none of them. Their concern was slightly allayed when it was pointed out that her engagement is only for two-and-a-half days per month. There was sympathy and understanding for the limitations that this inevitably imposed upon her. Plainly she had to spend early days reading into her brief and meeting those at Church House and in the Dioceses. If that meant she has not yet been able to reach out to survivors, so be it, but the limitations of time perhaps only warrant two cheers as she continues to get to grips with her task. She has started a blog, which is a welcome step toward transparency. Encouragingly, she notes in her blog that church outreach to victims is still inadequate. She is right about that, and how she proposes to address the deficiency – and how quickly – is awaited with hope, tempered with a certain world weariness. A similar qualified welcome arose in relation to the new role to be undertaken by Sir Roger Singleton. I have previously written about the suspicion of many victims (rightly or wrongly) towards our National Safeguarding Team. The creation of the new role of Director of Safeguarding standing apart from the NST is to be welcomed. Clearly, listening has occurred. Given that victims have extensive experience of NST shortcomings, however, one might have expected them to have been consulted in the design of the job specification for the role. One appreciates that the victim community is not homogeneous or necessarily agreed on the direction of travel, but having no discernible input from victims is not ideal, given our unfortunate history. Such lack of liaison with legitimately interested parties mirrors the church’s approach to compiling the terms of reference for inquiries into its other failings. 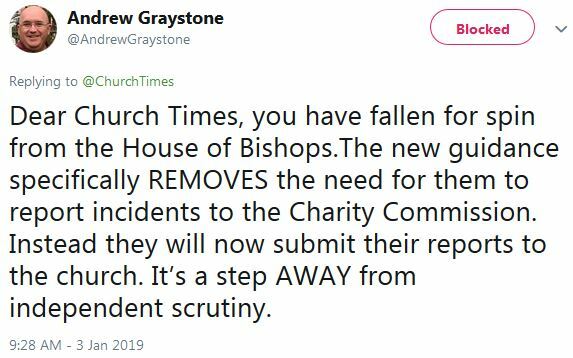 If you talk to the campaigners for Bishop George Bell, for example, they report a similar refusal in our leadership to publish, let alone offer for advanced discussion, the terms of reference and timetable for the investigation. Plainly a prolonged discussion of such detail cannot be expected and would lengthen an already tortuous process in such matters. Nevertheless, a confident institution would surely be happy to set out in advance its modus operandi across the board. An unwillingness to listen to the views and experiences of others who might contribute to good process suggests insecurity rather than strength, and in the case of the survivor community it adds to their sense of being seen as a nuisance rather than a resource to be utilised and valued. The new requirement for reporting Safeguarding matters to the Charity Commission was initially welcomed; and sharing data with the Church Commissioners sounds like an interim step towards external oversight. But the more it was discussed, the more questions arose. What exactly constitutes a “serious safeguarding concern”? 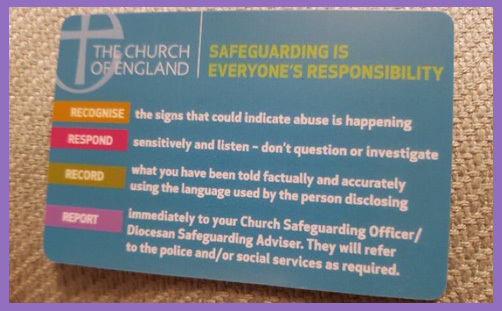 If a Parochial Church Council thinks a matter is serious but the Diocesan Safeguarding Advisor disagrees, will it be reported? Who will audit the statistics? How many staff will the Charity Commissioners have working on the data? Will that be sufficient? Given that the Church of England made dreadful errors over the Past Cases Review and that the figure supplied last year to General Synod concerning the number of live cases had to be quickly revised, such questions are not unreasonable. This is before we touch the controversy over the disclosure of abuse within the Confessional, which is specifically excluded within these Safeguarding guidelines. That may be pragmatically wise: better to get most matters reported than suffer a lengthy debate holding up progress on the majority of less controversial aspects. But it is still a problem for us. We have also had the suggestion that the controversy over Non-Disclosure Agreements (illustrated in the case of Jo Kind) should have been addressed by requiring that these controversial documents are also reported to the Charity Commissioners so that the prevalence and concentration of their usage can be monitored. Plainly, a lot has been happening: listening and learning have taken place, and there is a willingness to ‘get on with it’. Yet we constantly return to fundamental problems: how can these processes be shaped to our best advantage by both victims and the church’s elected representatives if legitimate stakeholders are not consulted? Within the new culture of good practice, every PCC is expected and required to keep a close eye on its Safeguarding environment. Yet when the General Synod meets in February, there will be no Safeguarding debate. Representations for time to be made available were made to the Business Committee, but should that even be necessary? The efforts were unsuccessful. We passed a wide-ranging un-amendable strategy document GS Misc 2092 last July (to which none of us had input), yet Synod will be given no feedback on progress, and no significant opportunity to review what was a pretty eventful past year. It should surely be a routine agenda item at every General Synod for a Safeguarding report to be offered in order to bring those charged with oversight of the Church to account by asking questions and probing decisions. A small church in the wilds with a congregation of 18 needs to have Safeguarding on its agenda every time its PCC meets. And the General Synod doesn’t?